ROOF is proud to announce that we will be hosting a new family very soon as a result of our most recent property acquisition in Newburyport! We are working hard to have the new unit in pristine condition in hopes of welcoming a family in time for the holidays. If you would like to help us with painting, cleaning or other areas of renovation, please send an email (info@ROOFOverHead.org) - we would love to have you! We are currently planning work days for Saturdays from 9am - 12noon. Join us every Tuesday ( AND Thursday 27 December) at Not Your Average Joe's! 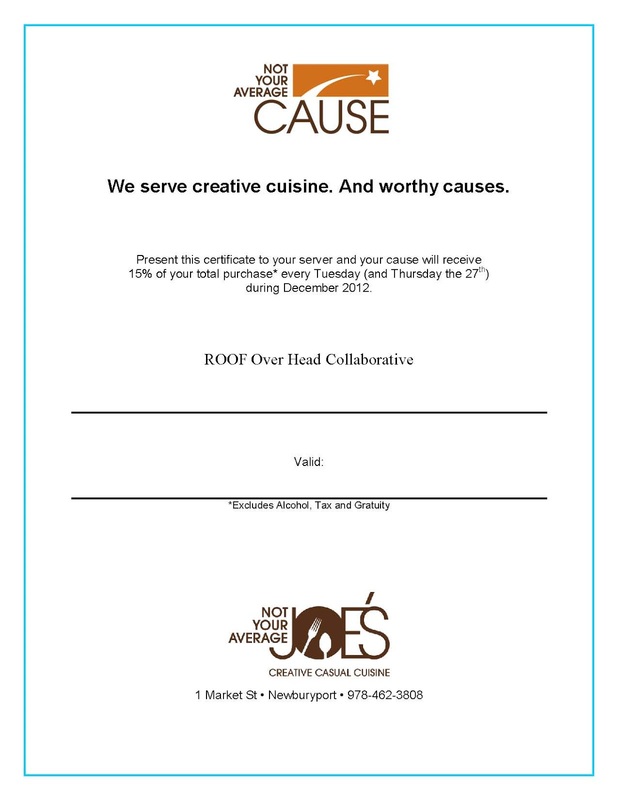 Print out the certificate below, give it to your server and ROOF gets 15% of your tab! 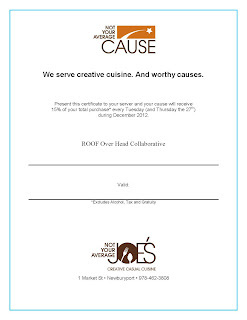 Enjoy a great meal and help ROOF help local families in transition!